The first time I discovered The Grapes, it was too early in the day to pay it a visit, so I made a plan to return to it. Sure enough, two months later, I did return and I was not disappointed. It is a narrow space, but quite long, stretching back to a terrace, that overlooks the river. There is a spacious dining room, upstairs, where a mouth-watering selection of food can be savoured. I opted to eat downstairs, choosing from the pub grub menu; Cumberland sausage, creamy mash with a caramelised onion gravy, washed down with a pint of St. Edmunds. Beautiful. 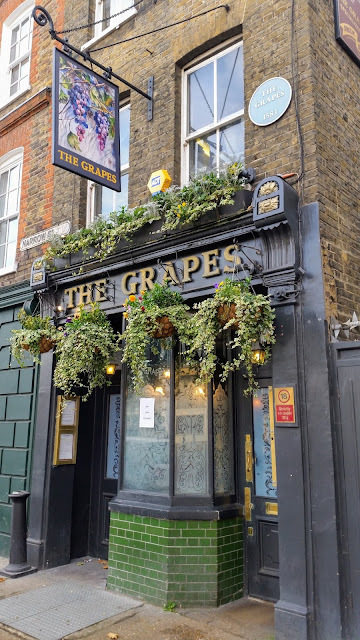 Originally called The Bunch of Grapes, it was built on Limehouse Reach in 1583, although the current building dates from the 1720s. One of its three current leaseholders is Sir Ian McKellen.